The red-tailed hawk is the most common hawk in North America. This close-up shows a rehabilitated male. Now that the trees are bare, a red-tailed hawk can be much easier to spot as it circles overhead, searching for prey. The chances are that it has already spotted you. The red-tailed hawk (Buteo jamaicensis) is found throughout Massachusetts. This bird of prey is the most common hawk in North America. A red-tailed hawk that you see in Westborough at this time of year might very well be a permanent resident. Or it might have come here for the winter. It might also just be passing through, migrating from a place such as southern Canada to a warmer land farther south. As with most birds, sound may be your first clue to the red-tailed hawk's presence. Its cry is a high-pitched, descending "keee-eer" sound. The cry is likely to seem far away, since the hawk is likely to be far above you. "Eyes like a hawk" is a saying with real truth to it. A red-tailed hawk can see much better than we can. With its keen eyesight, it can spot a mouse or other small rodent moving on the ground from hundreds of feet in the air. To catch its prey, the red-tailed hawk simply folds its wings and drops through the air. This rapid dive is a dramatic sight if you happen to see it. At the final moment, the hawk sticks out its legs, seizing and killing its prey with its sharp talons. Then the hawk carries its meal up to a perch and tears it into pieces with its curved beak. Besides hunting from the air, red-tailed hawks commonly hunt from high perches. You may have seen them perched on bare tree branches or utility poles along a road or highway. From these perches, they scan the area for prey. They also eat road-kill and sometimes unfortunately become road-kill themselves. The red tails that give these hawks their name are most visible from above. From the ground, you probably won't see the red tail, although you may catch a glimpse of it when the hawk banks in a turn as it circles in flight. Red-tailed hawks favor open areas (for hunting) with nearby woods or patches of trees (for perching and nesting). Development has benefited these hawks because it has created this type of landscape, and the red-tailed hawk's numbers have increased along with human settlement. If the wooded patches disappear with continuing development, the hawks' habitat may decline in the future. These birds of prey eat plenty of small rodents, so red-trailed hawks help to keep these animals from becoming pests to humans. They also take cottontail rabbits, which remain active in the winter, as well as snakes, insects such as grasshoppers, and small birds. Near cattail marshes in the early spring, red-tailed hawks frequently capture male redwing blackbirds, which conspicuously defend their nesting areas in order to attract females. Red-tailed hawks are territorial. Their territory must include hunting grounds, perches, and nesting sites. A pair of red-tailed hawks defends their territory from other red-tailed hawks. The pair may stay in the same territory for years, often repairing and re-using the same nest each spring. The hawks may need to defend their nesting site from owls, which compete with them for the same kind of nesting site. Surprisingly, house sparrows sometimes live in active red-tail hawk nests. You may notice a pair of red-tailed hawks soaring together in the spring breeding season. Such flights may be part of their courtship behavior. Red-tailed hawks mate for life, and one takes a new partner only if the other one dies. These hawks like to nest at the edges of woods, often in white pines. Both the male and the female build the nest with twigs and branches and line it softer materials such as pine needles and bark. After the female lays eggs in early April, both hawks keep the eggs warm, although the female does most of this work. The male usually hunts and brings food back to the nest. Once the eggs hatch, this division of labor continues. The female tears up food and feeds it to the young. The young begin to leave the nest around 6 weeks of age, but the parents continue to feed them as they improve their flying and hunting. The young typically become independent when they are about 10 weeks old, but some stay with the parents for about six months. Adult red-tailed hawks have no real predators, although crows sometimes gang up on a hawk and chase it off. The eggs and the young are vulnerable, especially to crows and great horned owls. If a red-tailed hawk survives its first two years, it can live about 20 years. 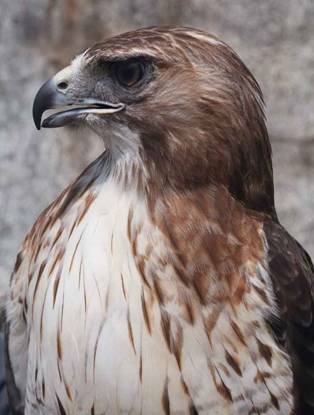 In the past, red-tailed hawks were despised as "chicken hawks" that threatened farmyards. People used to hunt them, but these hawks are now protected by law.